While we have access to what the date and time are seemingly everywhere, we’re always buying calendars or watches every new year. We’re fascinated with time since we only have an allotted amount of it to experience life. If your phone, computer screen, wall calendar, and wrist watch aren’t adequate enough at showing you what day it is, then you might be in the market for another way to make sure you know when you are. The Timor Perpetual Calendar will be able to show you what day and month it is, but only if you remember to change it every day. 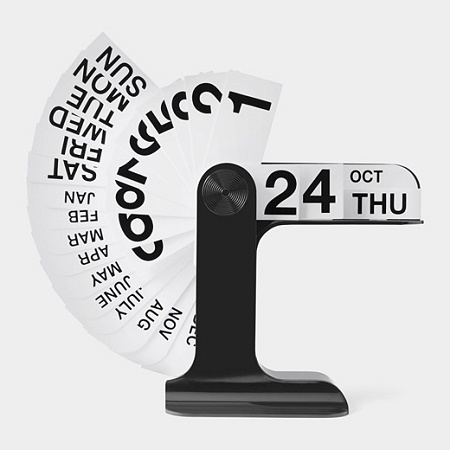 This is comprised of several cards with bold text which you will flip to display the day of the week, date, and month. In other words, should you forget this for a few days, you might end up confusing yourself. This is made of ABS plastic and PVC lithography, and will cost you $203-225. Needless to say, this is something that you can’t just buy willy-nilly. It is mainly for aesthetic purposes, and will really have to be a piece that speaks to you to be worth the money. The target audience is quite likely to be those who are fond of all things vintage, as this has been in production since 1967. Otherwise you can just rely on one of the other myriad of methods there are to be able to see what the date is.